The Women, Peace and Security (WPS) agenda has great transformative potential, and puts the gendered impacts of conflict at the centre of discussions and actions on conflict. It calls for including women affected by, or part of, conflicts in peacebuilding and conflict-resolution processes, ensuring the protection of their rights and provisions for their specific needs. Despite this, conflict-related displacement and its gendered dimensions have been either neglected or treated as subjects of marginal concern in WPS policies and discourse globally and in the Middle East. Except for Jordan’s recently launched National Action Plan (NAP) to implement WPS, other countries with WPS NAPs, such as Iraq and Palestine, despite having large numbers of internally displaced persons (IDPs) and refugees, have not integrated displacement in a meaningful way into their planning. Nor has the UK NAP, which has Iraq and Syria among its focus countries, integrated displacement and its gendered dimensions into its strategic goals and planning either (although there are some recent examples of UK programming on displacement). 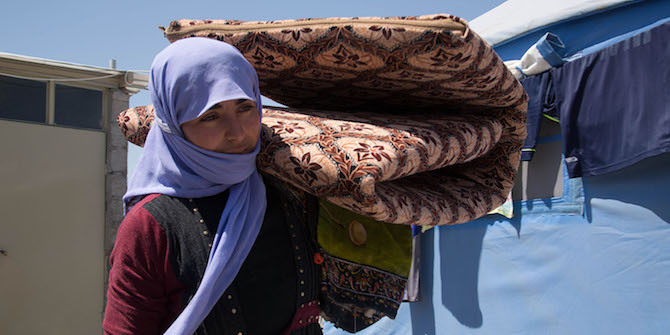 Such omissions are not surprising as globally there is a disconnect between the WPS agenda and the issue of conflict-related displacement, despite the increasing work and expert research undertaken with an emphasis on women in the context of displacement. At a two-day workshop held on 26–27 September 2018 in Jordan, organised by the LSE Middle East Centre, a group of experts and stakeholders from civil society organisations, the UNHCR, the UNDP and UN Women, in addition to policymakers from across the Middle East, Europe and the UK came together to discuss the gendered dimensions of conflict-related displacement and suggest ways of improving responses in this area. The workshop focused on international perspectives about displacement and WPS in the Middle East and the situation in specific countries including Iraq, Jordan, Syria, Lebanon, Palestine and Yemen. The high level of expertise at the workshop led to fruitful discussions and revealed important insights into international policy frameworks, policy implementations, displaced persons’ and women’s lived experiences and long-term development issues and structural inequalities, both in general and in each country’s specific context. In small groups, participants joined in policy development breakout sessions to generate specific ideas for synergies between WPS and responses to displacement, and to develop tangible recommendations for addressing the gendered dimensions of conflict-related displacement. Workshop participants highlighted the overlap between the impact of conflict-related displacement and its long-term and gendered nature with all aspects of the WPS agenda – women’s participation in peacebuilding and conflict-resolution, protection of women’s rights, women’s and girls’ empowerment and the prevention of conflict. Incorporation of the issue of displacement into the WPS agenda would improve strategies regarding the protection of women, prevention of harm, recovery and relief during and after conflict, and would also enable their participation in their communities and wider processes that affect them. The absence of women and the lack of gender perspectives in decision-making processes at every level, including in camps, hinder women and members of the LGBTQI community from having a meaningful impact on the design of the protection provisions and the development of support systems in and outside camps. Their absence also prevents them from influencing decisions over settlement and return. Workshop participants agreed that women displaced by conflict should be afforded the benefits that come from the implementation of the WPS. Displacement compounds existing gender inequalities in society, rendering displaced women even more vulnerable and it has significant gendered dimensions that also require a long-term perspective. Displacement is a huge issue globally. However, despite its scale (as of 2016, 68.5 million people were forcibly displaced worldwide), its long duration (26 years on average) and its protracted nature, it is usually treated as a short-term issue. In the Middle East where cycles of conflict and violence have led to consequent layers of displacement for decades, usually leading to individuals being displaced multiple times. Discussions during the workshop highlighted that in the face of a long-term and complex issue such as displacement, short-term and humanitarian responses are important but not appropriate on their own to address the gendered challenges. Participants drew attention to the need for closing the gap between humanitarian and developmental work with regards to displaced women, and emphasised the importance of achieving a transition from ‘relief’ to ‘development’. They also stated that policy responses to protracted crises, such as displacement, generally tend to be un-engendered or they fail to capture the long-term and structural gender inequalities that lead to discrimination and violence. This, combined with the security-driven concerns of the donors and lack of gender and WPS expertise among humanitarian actors, lead to ineffective strategies and response programming that are limited in improving displaced women’s circumstances. Finally, workshop discussions and insights from participants revealed that there is urgent need for the WPS agenda to better address conflict-related displacement and its impacts. This would potentially generate significant opportunities for preventing gender-based violence and increasing women’s participation. There is a significant link between addressing structural gender inequalities and preventing discrimination against women. Therefore, finding more effective, useful and creative ways with a long-term view to address structural gender inequalities and their impacts on displaced communities is essential for realising transformative change. These and other insights from the workshop will be shared in more detail in the policy report, which will be co-written by the LSE Middle East Centre and Gender Action for Peace and Security and published in Spring 2019. This is a report on the proceedings of a conference on Displacement and WPS in the Middle East, held in Jordan on 26–27 September 2018. The project of which this workshop was part is funded by LSE’s Knowledge Exchange and Impact Fund.